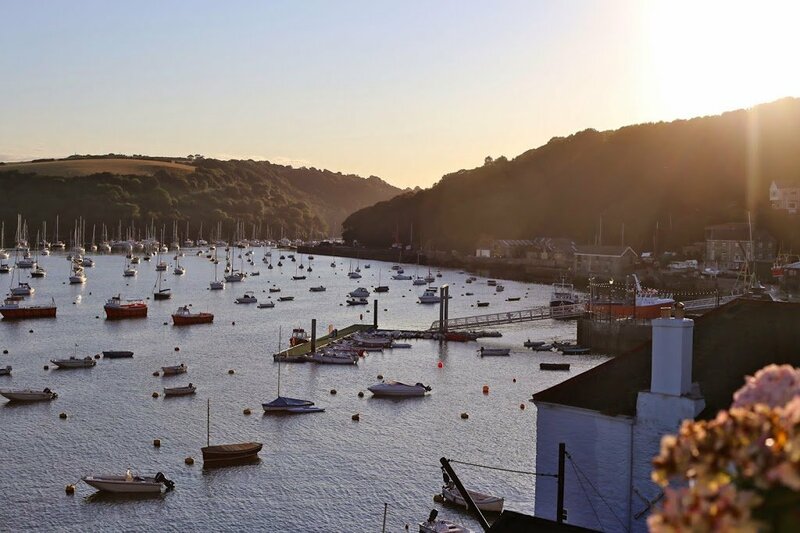 My grandmother lives in Polruan, a tiny fishing village in Cornwall. It’s so small that you have to write “Polruan by Fowey” when mailing a letter so the post office knows how to find it. Fourteen of us piled into her house, and the rest of our relatives rented cottages nearby. There were 20 adults and 6 children under four years old! 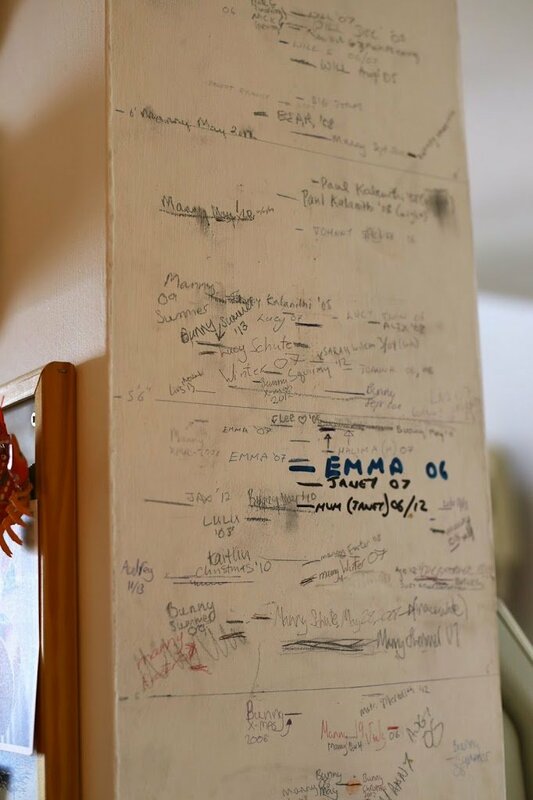 For decades, my grandmother has had a growth chart on her wall. It was sweet to see how much everyone has grown, and we added Anton’s teeny mark. 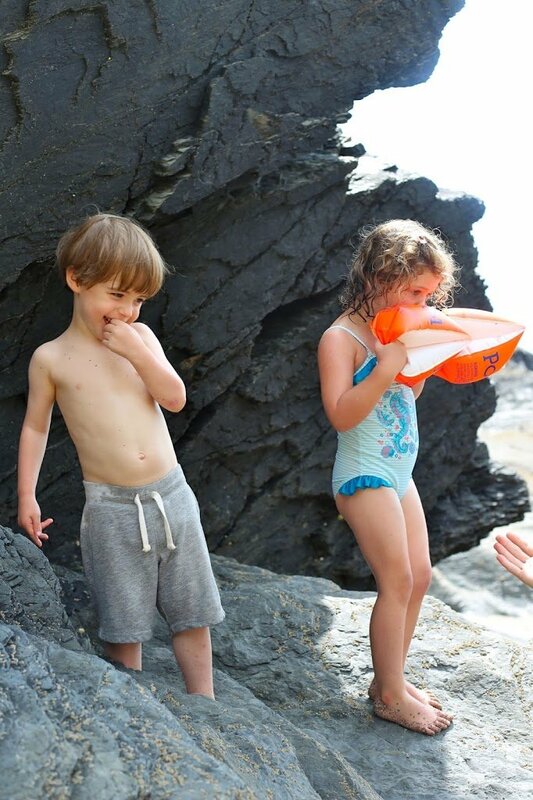 The rocky beaches and cold bracing water were perfect for splashy fun afternoons. One afternoon, my aunts and cousins were sweet enough to take care of Toby while Alex and I took a long walk (with Anton in tow). We hiked along the cliffs above the ocean. 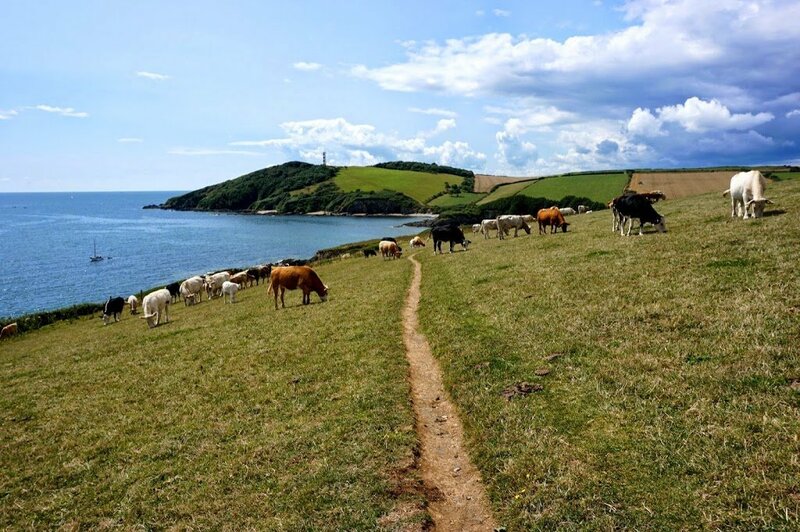 The funny thing about walks around Cornwall is that paths often run through cow fields. 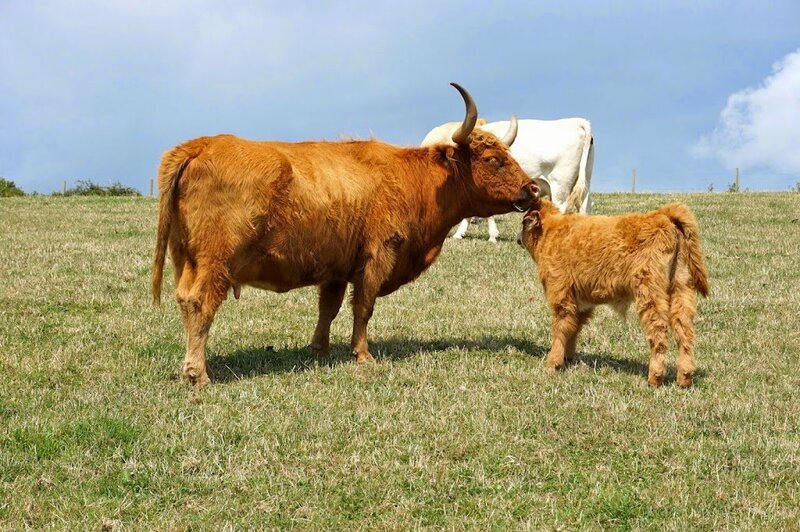 Sometimes you see adorable calves…other times BULLS! How stunning are those views, seriously? I did this walk so many times as a little kid that it felt really lovely to carry Anton there. We learned on this trip that Anton is a real water baby! He was fearless and wanted to dunk his whole body in. 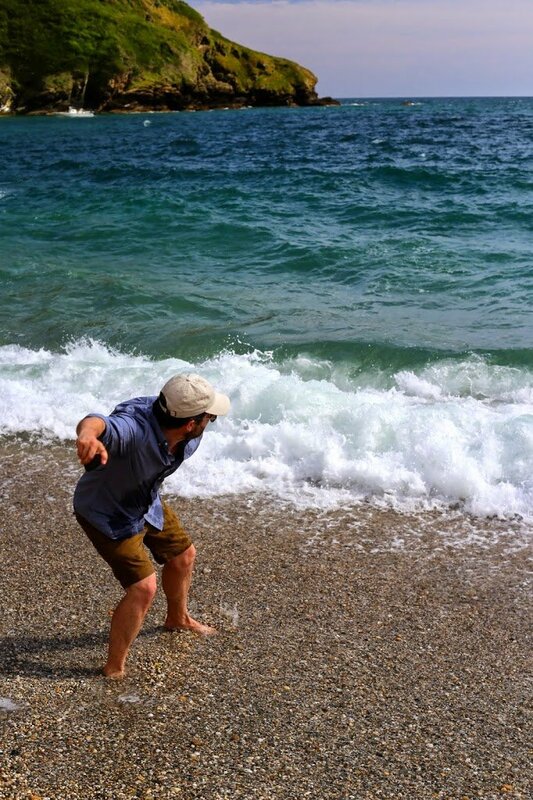 Also Alex can skip stones like a gazillion times. Always something new with that guy! 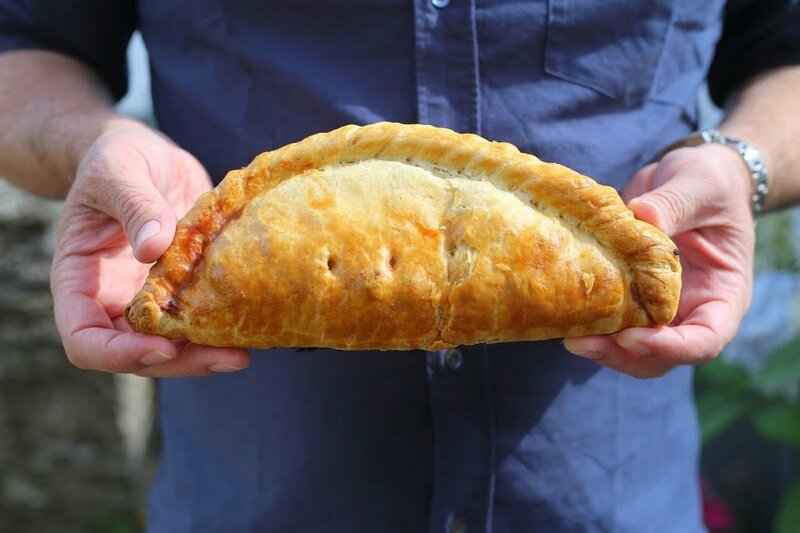 We ate delicious food in Cornwall, including pasties, which are dough pockets filled with beef, potato, carrot and onion stew. We also tried “chip butty” sandwiches, which are french fries between two slices of bread. Not for the faint of heart! In the evening, we’d put the little guys to bed (with varying success) and sometimes sneak out for a last little walk. 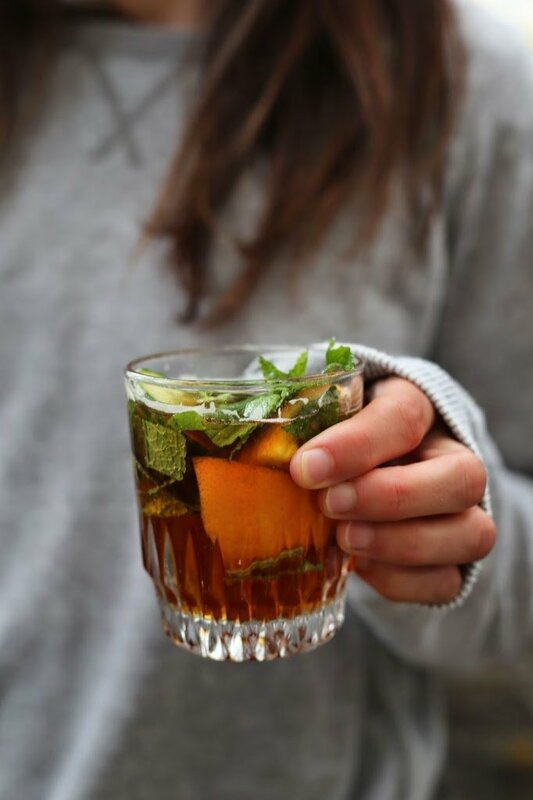 …but more often, we’d have drinks at home before dinner. It was such a nice daily ritual. The other funny thing is that Nick and Alex look so similar, and they basically wore the same clothes. We all kept confusing the two out of the corner of our eyes. The final day, we visited my grandfather’s grave. My grandmother sometimes brings whiskey to pour on his grave, but this time my aunt Lulu brought rosemary, garlic and olive oil, since he loved rack of lamb. I felt especially nostalgic this year because Anton has his top lip. 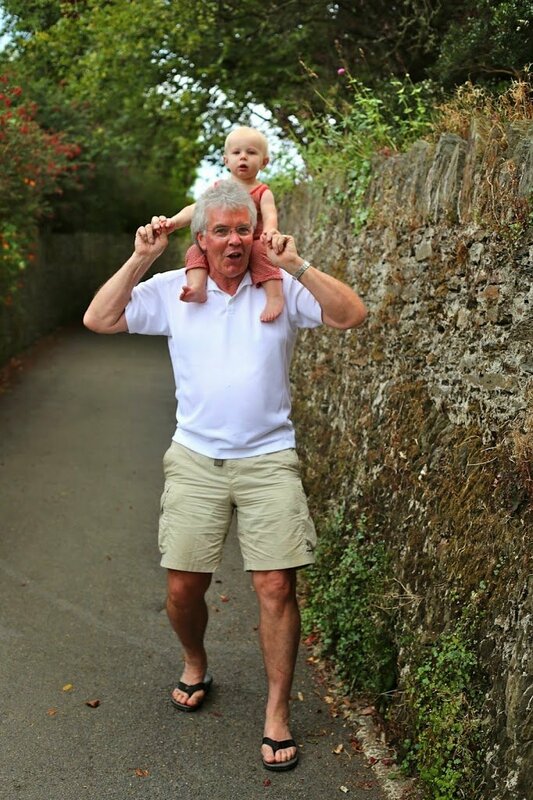 I can’t resist sharing a few photos of a shoulder ride around town with Anton and “Opa”! Not pictured: VERY early mornings, tantrums, teething, jet lag, squabbles…One day, I should do a post of vacation outtakes, ha! P.S. Our last trip there, two years ago. What does the gravestone say? I can only read part of it but it sounds beautiful! My aunt and uncle lived in pollutants in the 1970s. They had the fish and chip shop and grocery store at Sunray 9 Fore Street. 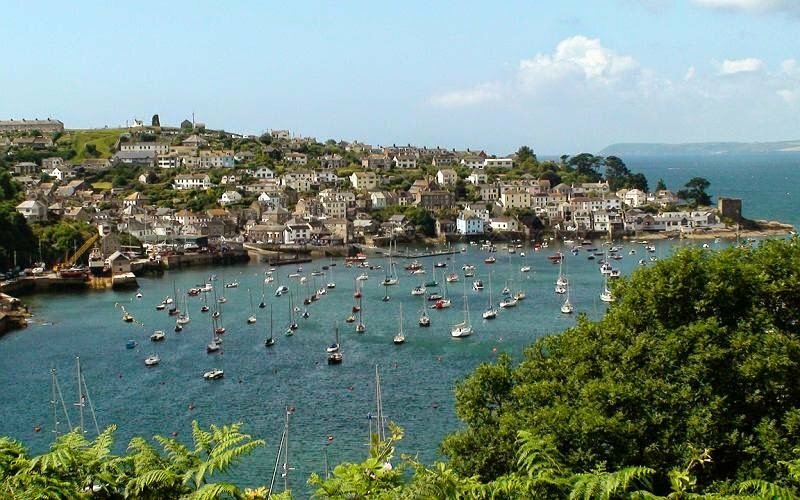 We spent a lot of holidays as children here and my sister and our children holiday in fowey most years. We always take the ferry to Polruan to relive our memories. Wow, what a gorgeous place!!! I just don’t get why London is the big thing when it comes to England, when the countryside is just soooooo breath-takingly beautiful! 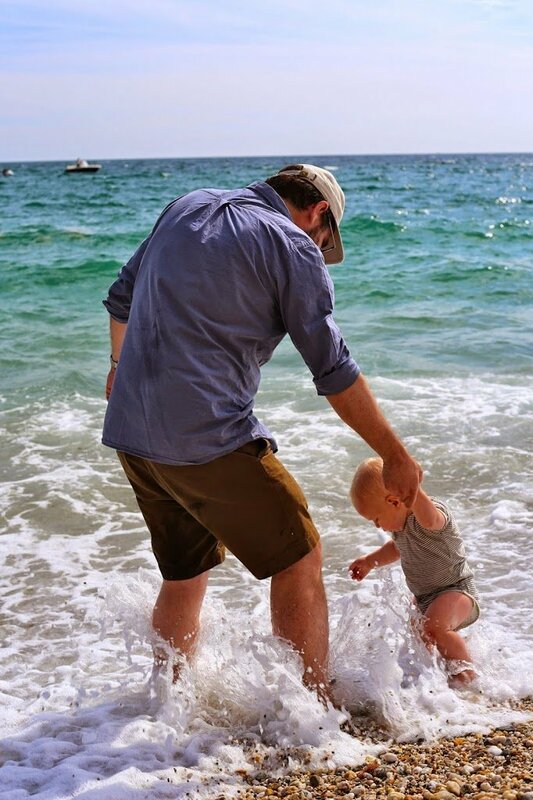 Thanks for sharing so many beautiful photos of your holiday and also of your sweet family! These photos are amazing! And I love how you wrote about your family trip without boring us. Nice! Aren’t the playgrounds there fabulous? I just told my husband that I think I need to live there. Thank you for sharing! So charming that the post office needs a wee bit of help to find your Grandma’s home. I do hope she receives many a letter from all her lovely grand-kids. Lovely indeed. For a minute there, I got to pretend I was part of that lovely family, wonderfully photographed trip, long line of stories to tell. Thank you so much for this sharing. What a dream! These photos are incredible and your family is lovely and they sound so fun :) what a wonderful vacation! Great photos, although that one is probably not a bull. Those are Scottish Highland Cattle, and both males and females have horns. And the calves are adorable!! We raise them in West Virginia. Cornwall has to be my favorite corner of the globe. Such stunning photos! 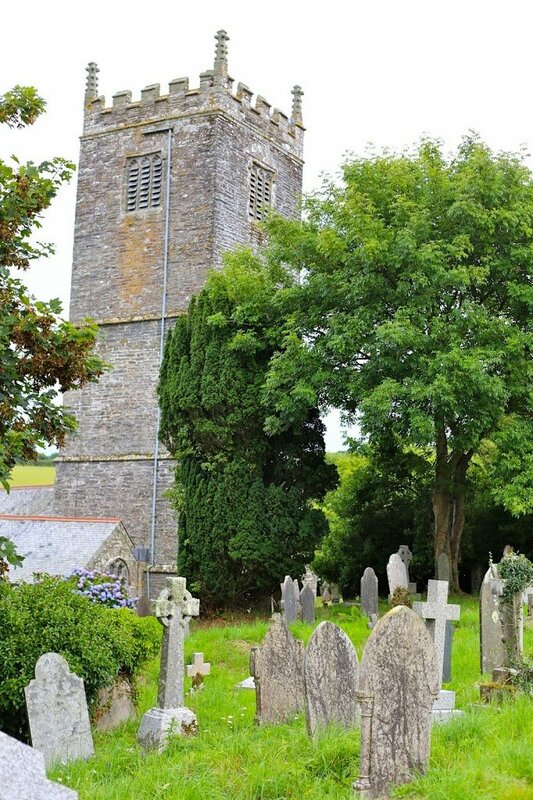 I’ve been to Falmouth most recently, but would love to visit your Grandmother’s village. Looks like something from a dream. Your trip looks like it was absolutely wonderful! Thank you for sharing such beautiful family memories with us. I woke up this morning feeling terribly nostalgic for the days when I lived in England and Scotland and your pictures really have me thinking a trip back might need to be in my near future. What wonderful photos, thank you for sharing your trip with us! 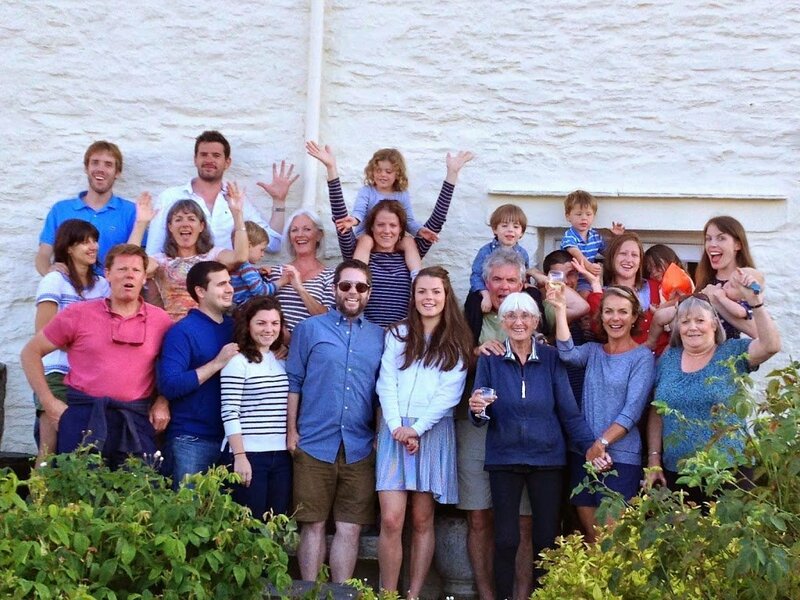 How lovely it is to reconnect with family and now I’m dying to go to Cornwall! 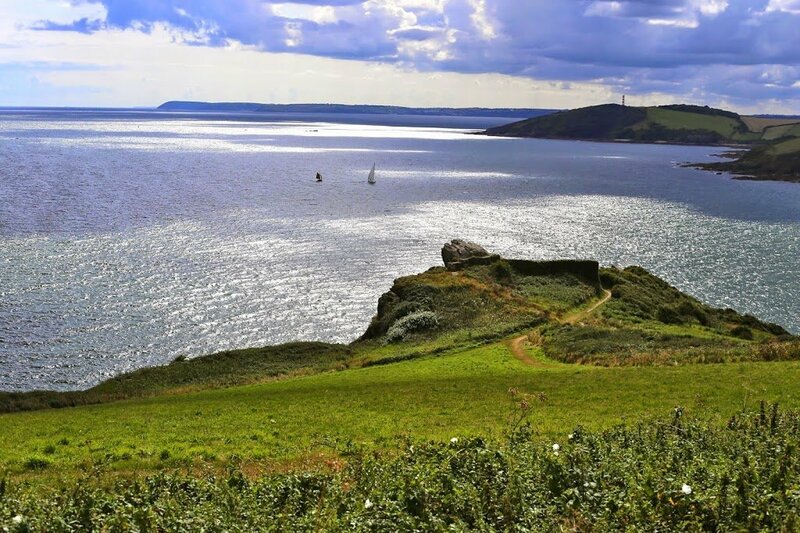 I walked these coast paths from North Dorset to the tip of Cornwall, bit by bit, summer by summer, when I was a child with my family. We stayed in hostels, pubs, and camped along the way. 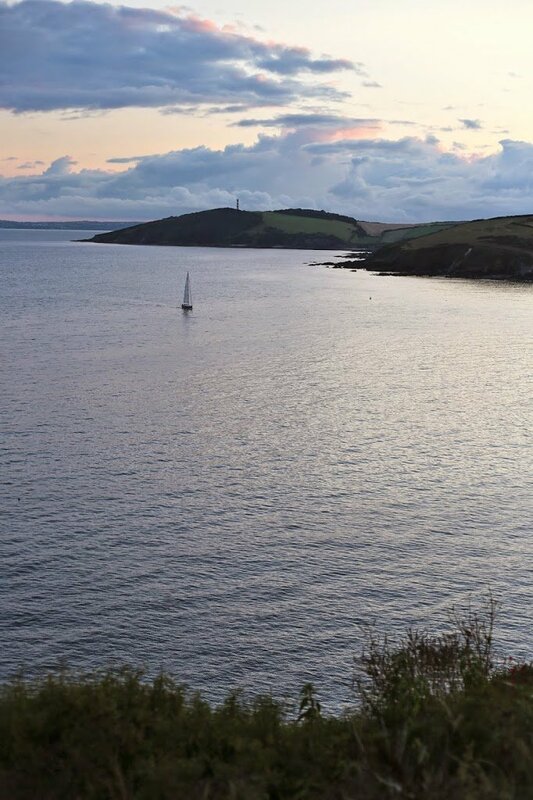 I know Polruan and Fowey, and your pictures bring back such good memories. 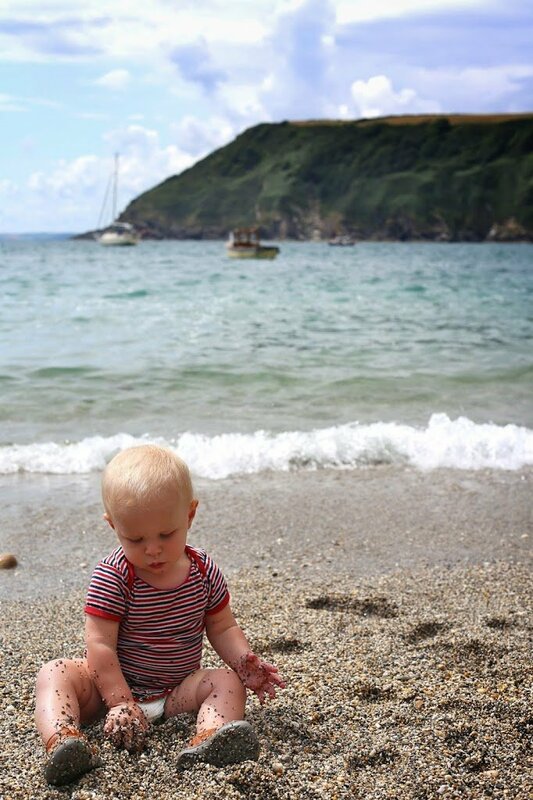 I hope your boys feel as strongly connected to Cornwall when they’re older as you clearly do. It’s a special, tucked away, place and I swear there’s something magical in the air. Funny I should read about chip butties here! I am from Northern Ireland and while in Mexico a few weeks ago my niece showed her American friends how to make a chip butty and it apparently blew their minds! They are good stuff. 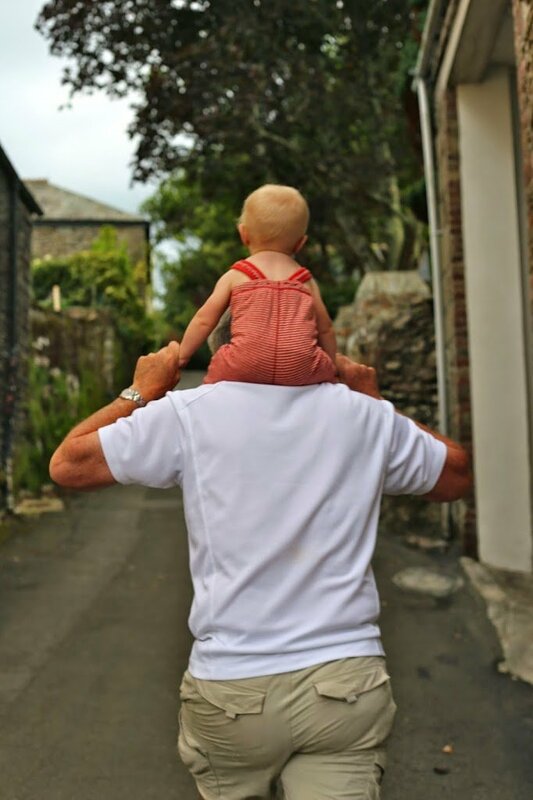 Always love your posts but I especially love this, “Not pictured: VERY early mornings, tantrums, teething, jet lag, squabbles…One day, I should do a post of vacation outtakes, ha!. I’ve spent 10 weeks in Cornwall and hiked the same paths, and been to the same pub. Those weeks were some of the best weeks of my life. I will revisit it someday soon, and I wouldn’t even mind to live there forever. A fairy tale. These photos and the account of your visit sounds magical. Out of curiosity have you ever read anything by Rosamunde Pilcher? She is a favorite author of mine and many of her books are set in Cornwall (seeing your pictures feel like her books brought to life). She is a beautiful write you should check her out. LOVED your post! 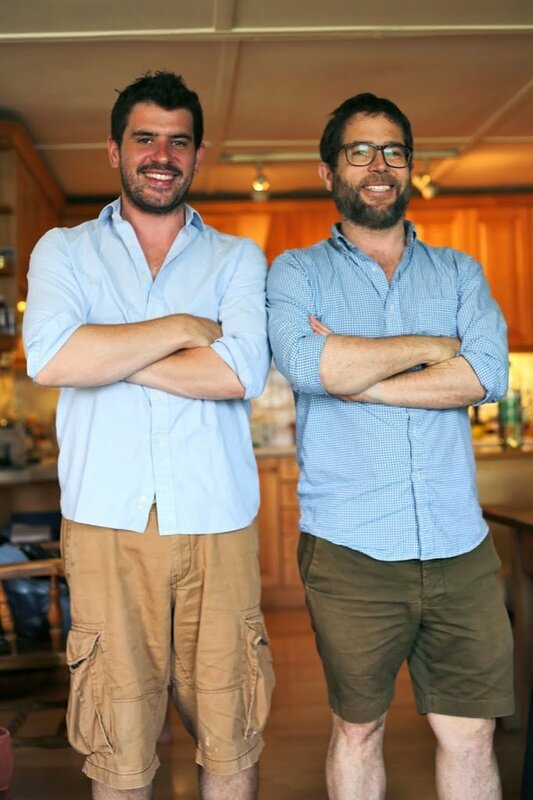 We just rented a cottage in Polruan for a week in June (then spent a few more days in Polperro) and your photos were so similar to many of ours. It’s a magical place! My daughter (Jenna Francisco) shared your post with us and we were in raptures, longing to return. What an amazing experience for your whole family! Oh Bisbee your comment is so funny I think this may be a case of mixed American/English we say top in England as in “may I top that up for you” its a question not a philosophy but thanks for the giggles! 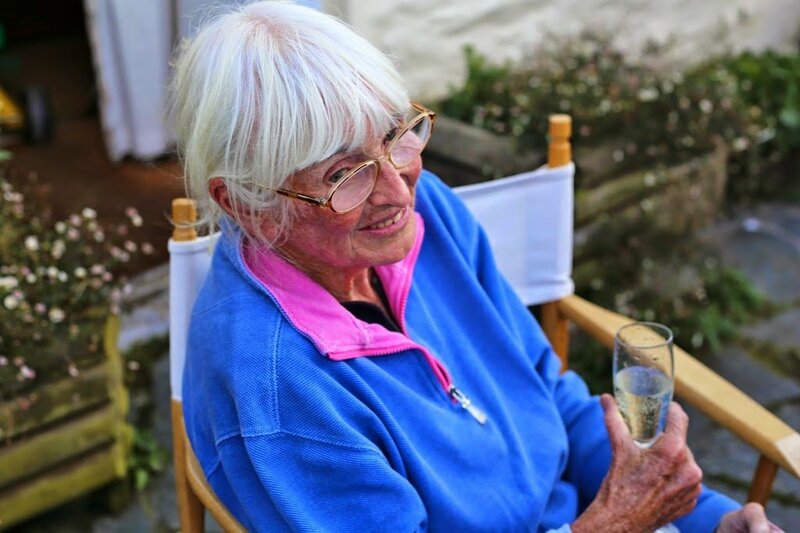 My mom loves Cornwall and has been several times…she just spent about 10 days there. Some of your photos look just like hers! 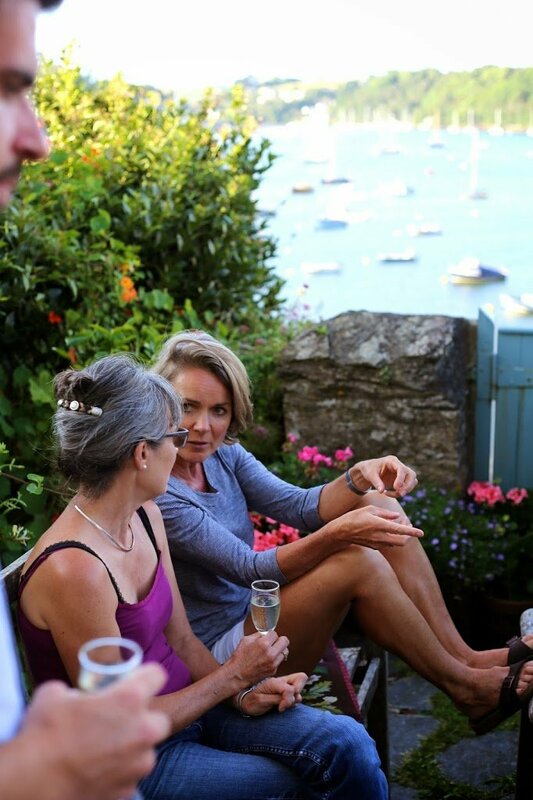 She stayed in Poluran and Fowey! I can’t wait to go there. 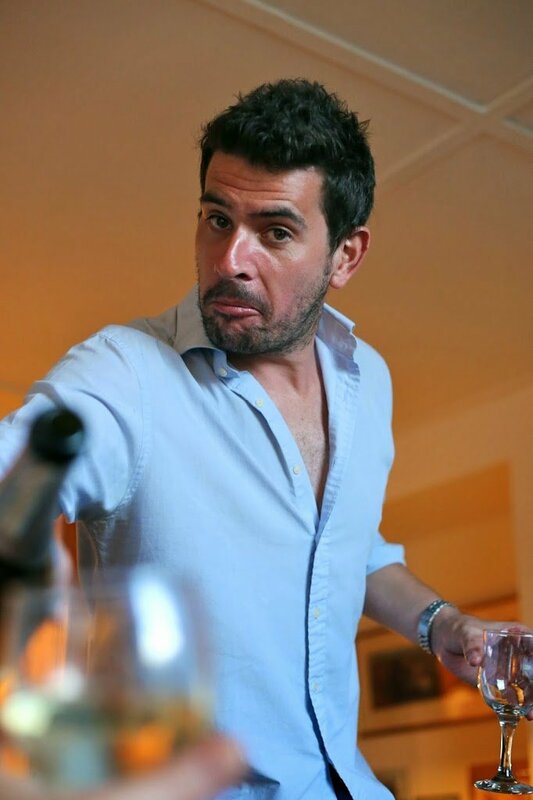 And I’m glad you mentioned that what was not pictured…I write about family travel and love it when people are honest! Doing it with small kids is not all roses. :) But so worth it. omgosh! i’ve always wanted to visit england and wow. this post is everything. i’ll probably keep visiting just to re-read it all again and again. thanks so much for sharing. Hi Joanna, I enjoy reading your blog so much! May I ask if you took the aerial picture of the beach here? And if so, would you be willing to share it…I would be willing to buy it. I have been looking for something like that to blow up and make a poster out of. Thanks! jess, bo is actually her full first name! they just thought it was cute :) and i agree—family travel is very different from a relaxing vacation! :) we were exhausted when we got home haha. 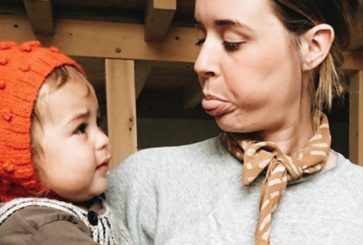 Looks like a fun trip, although I agree vacation outtakes would be great to see too — vacations with toddlers have a different meaning altogether than regular vacations. May I ask if your niece’s name Bo is short for something? I love that for a girl, and was wondering if it is a nickname. Thanks for sharing your vacations pics, Joanna! I visited Cornwall about 10 years ago and loved it. You’ve inspired me to finally take the two kids on my husband’s annual family reunion to the Outer Banks next summer! Oh I love big family trips like this. Looks like a wonderful trip! Those cliffs and the sea are beautiful. Oh gosh .. What a lovely family and great place. 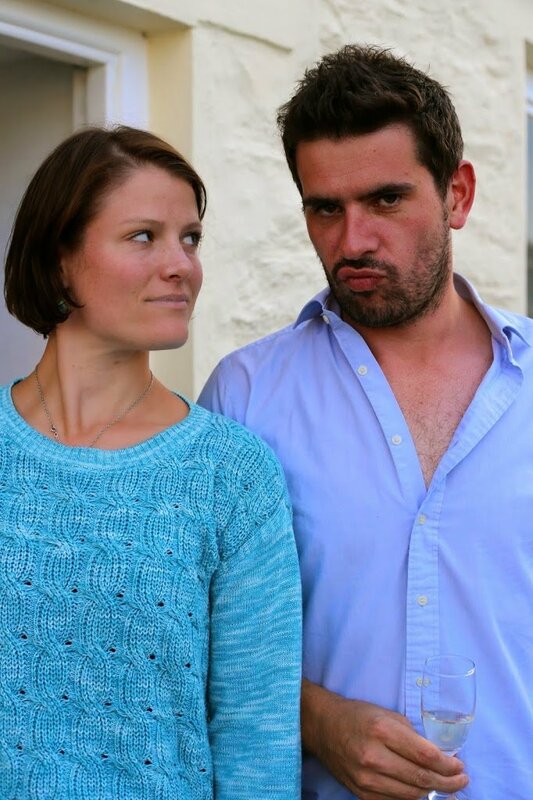 If you don’t watch Doc Martin, tune in … I think you can get it on you tube now, but iTunes for sure. Your vacation spot could easily be there, they must be very close. Speaking of out takes, we went on vacation every year … I’m still amazed my parents continued to take us. My sister and I were the most reluctant travelers ever. Good luck on the move, will look forward to updates. So beautiful! What an incredible trip. You have such a beautiful family. Your pictures made me feel like I was there too. Thank you so much for sharing this with us! Beautiful photos. It looked like you had such a great time. 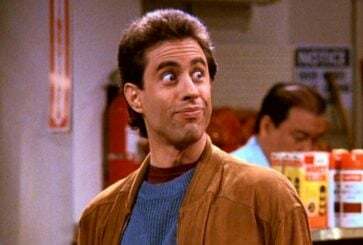 On a funny note, my first name is Joanna and my mom’s maiden name is Goddard. Maybe we are related in some far off distant way! Cheers! Wow, what a fantastic place! Beautiful photos! So lovely. And I love your “not pictured” list – I always appreciate your openness. So lovely. Your writing is beautiful. Just booked our flights to visit family in New Zealand. Yay for travel with toddlers and babies! Hi Joanna, what camera do you use? Your photos look fantastic and Im looking for a new camera for my upcoming honeymoon. Thanks! Do you watch the BBC show Doc Martin??? 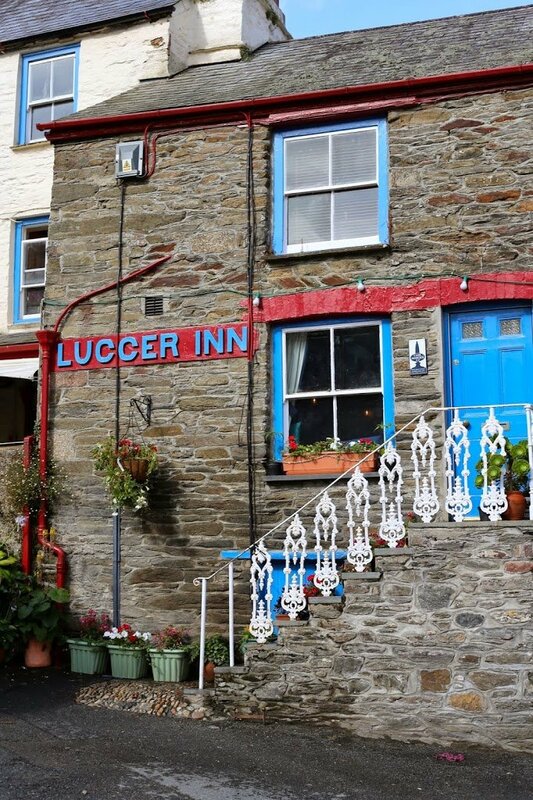 They film it in Port Isaac and my husband and I are OBSESSED with the idea of moving to just this type of little town. Oh my gosh…so lovely…I must visit England and soon. you should *Definitely* do a post of your vacation out takes we all like a laugh after things like that have happened, right?! These pictures are insanely gorgeous and I loved looking at every single one. I honestly had no idea England was so beautiful! But its stunning! It was also sweet to share your grandfather’s story. I always find that my soul feels so good in those places where my whole family has been. It’s so good and centering. I’m glad you all had a wonderful holiday! Wonderful family Joanna, and love the photos! When I was a kid we holidayed in Polruan every single year. It’s terrifying how many memories those pictures drag up! 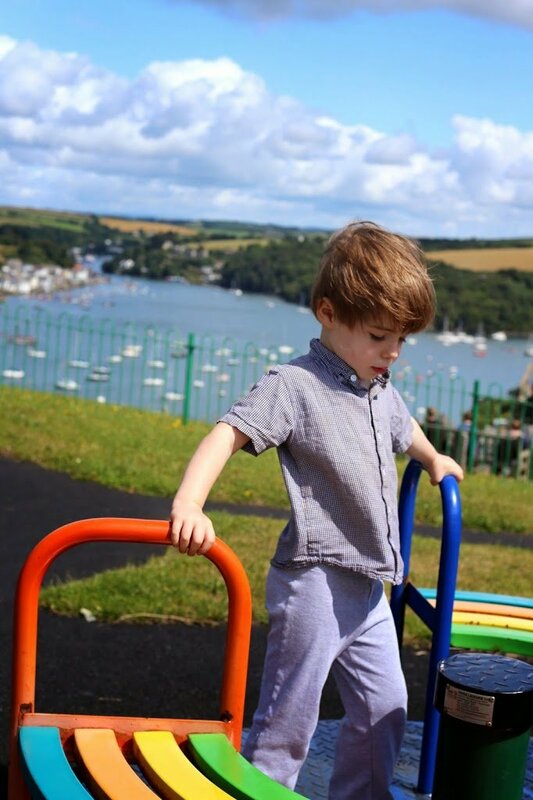 The playground at the top of the cliffs, banana splits at the Lugger, the little ferry that chugs between Polruan and Fowey – I want to be back there right now! 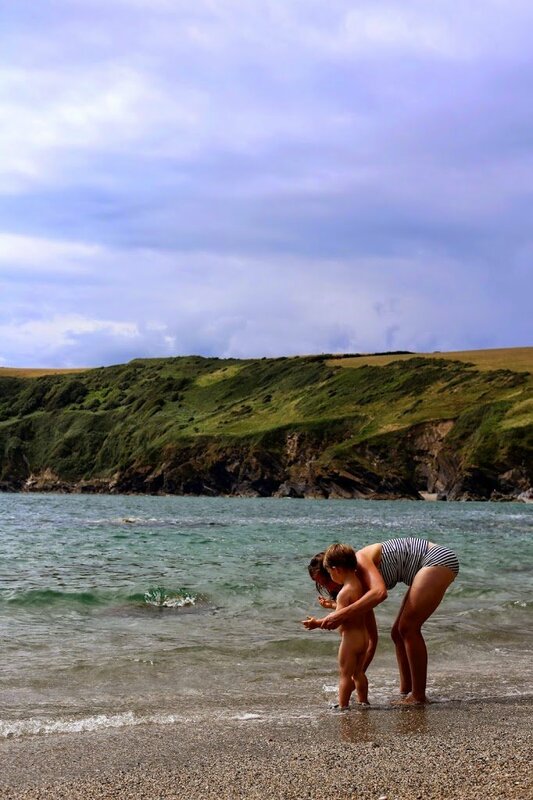 I’ve only just discovered your blog Jo, but what gorgeous holiday pics – thanks for sharing!I’m English and live on the south coast and have wonderful, nostalgic memories of family holidays in Cornwall from my childhood… as is evident from your pics, it really is a heavenly place. What a GREAT holiday post. I love the way you write, all the love, the joy and the fun that oozes from your posts. And the depth, it’s the depth that makes it work. The depth in your words, in the way you are, your ability to show a lot of who you are and still remain a mystery. It’s such a treat to read your adventures, thanks for sharing! Oh I know how you feel! I’m half Australian, half Canadian, and grew up in Canada, visiting my Aussie family every couple of years. Now that I’m an adult and living Australia, I go back to Canada every two years or so, and I always feel homesick immediately after the holiday! Beautiful pics! It looks fun, cozy and not the typical cloudy English summer! I miss England too, and I’m not even English! Wonderful! My mum lives in Fowey so I have the pleasure of visiting twice a year. 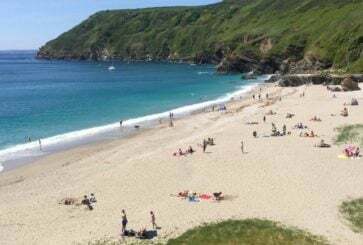 Lantic bay! Readymoney! The Hall Walk! The Camel Trail (still disappointed there are no actual camels! Love the blog btw! Owen & engine! It’s an English Gastropub in Logan square with seasonal fare and local everything. They have a rotating pasty, bubble and squeak, fish and chips flown in fresh daily, pims cups, 15 draft beers and not to mention a burger to die for. English comfort food with a modern twist! It’s absolutely my favorite spot in chi-town. Oh how I miss pasties. I discovered them in Australia and fell in love. 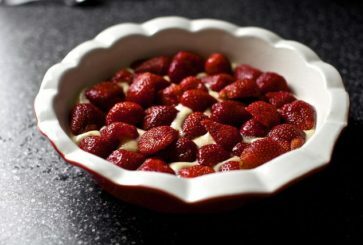 I really need to figure out how to make them now that I’m back stateside. 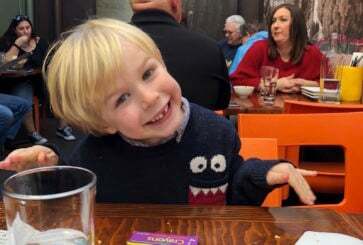 love that you mention what was NOT shown in pictures… i was beginning to think you had miracle children without jet lag! my 9 month old came to switzerland with us last month and he had terrible jet lag… up for FOUR hours in the middle of the night the first night. by the time we got home he had only just adjusted, the poor thing. looks like you had a beautiful vacation thank you for sharing. These are lovely photos and he scenery is just stunning! Love that you got to spend time with your family. It’s so precious when loved ones live so far away. Amazing! You have a gorgeous family and what a beautiful town. Now another town to add to my list of to go to visit places. Such fun to read and imagine being there. I want to go now – I will stay in a small cottage and become the old lady down the lane. Jo, these pics are breathtaking! So glad you and your family got to experience this together! Joanna, have you read “Coming Home” by Rosamunde Pilcher? If not, you absolutely MUST! (There’s a movie, too.) The book is set in Cornwall before and during World War II. It’s a cozy coming of age story and one of my favorite books ever. I read it every year. Family holidays (with abundant “top offs”) are the best holidays of all. p.s. where is Bunny’s sweater from? It’s so great. Wow, that couldn’t get any prettier! Outtakes soon please! Too funny! It looks EXACTLY like the scenery in the movie About Time….wow! Loved your post. I was born in London and moved to the States as a child, but almost all my family lives in England still. My aunt lives in Exmouth in Devonshire, and my memories are very similar to these. I miss the cream teas, butties, fish and chips, local pubs. While you were in England I was just on the west coast of Ireland in County Clare for my husband’s family reunion! 17 adults, 2 teenagers and 2 babies and also crazy with jetlag, squabbles, tears and moans. Such a fun time. Family history and nostalgia are wonderful. Wow. Just so beautiful Jo. Thank you for sharing pics of your lovely vacation. And your family looks like so much fun!! Gorgeous! Makes me miss my time in England and long for a pastie! Lovely post! I grew up on Pasties & chip butties! Polperro just round the corner is lovely too. The photography is breathtaking, Joanna! 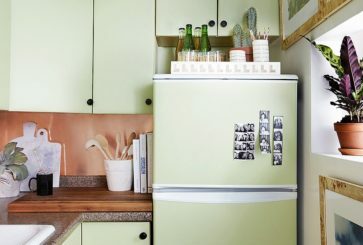 I really adore the heigh measuring wall. Joanna, thanks so much for sharing these! Is it strange that they made me feel nostalgic for people and places I’ve never known?! I’m so glad you had such a great time – but as a mother of two young boys myself, I’d be interested in hearing/seeing the out takes. We’ve just had a rather unsuccessful holiday of our own! My husband and I have a hard time letting to of our own expectation s of what a holiday should be like with kids! It looks so beautiful and relaxing there. So nice that all your family can reunite. What a beautiful time! Anton has become such a blondie! And cornish pasties are where it’s at. Lastly, I hadn’t heard of the tradition of pouring whiskey/rosemary on a grave. So great! Oh Joanna, thank you! I had such a stressful day and browsing your beautiful photos and seeing what a lovely family you have was so nice. Glad you enjoyed your trip. Cornwall looks absolutely delightful. Hi Joanna – what a beautiful vacation and a beautiful family! Since this post is about your family, would you mind letting us know how Lucy and Paul are doing? Well, I hope. 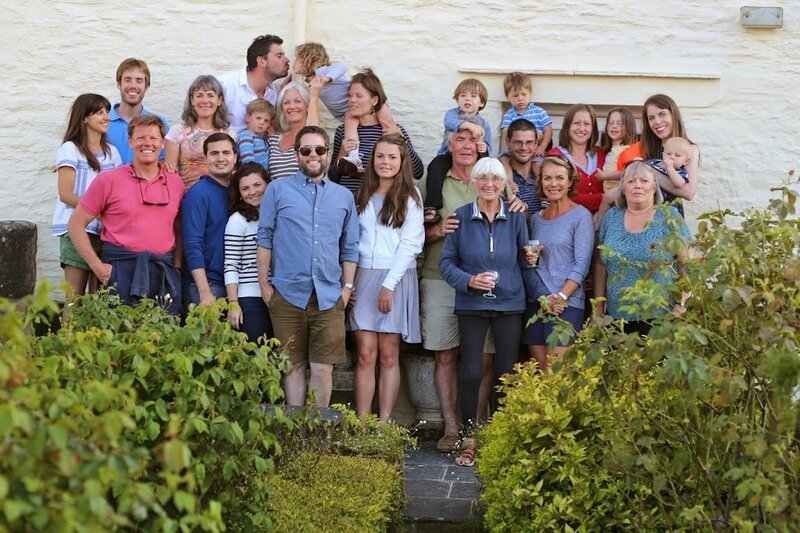 My father’s family lives all over England and my Mother’s family lives in Bude. Cornwall has always been my favorite. This is just brilliant- all those coastal towns are so precious. I miss the cream teas and long walks! These photos make my heart sing and cry at the same time! your sister didn’t come? How is your brother in law? Amazing!!! 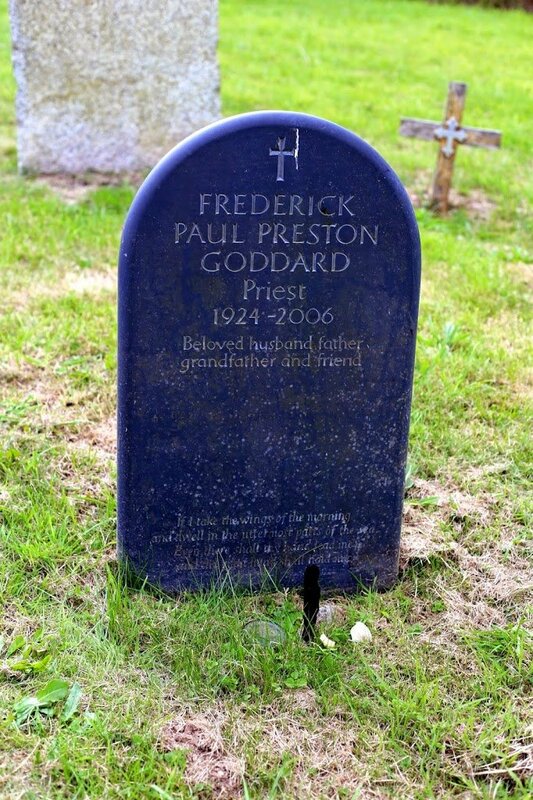 Is it your paternal grandparents?? It all looks so magical!! 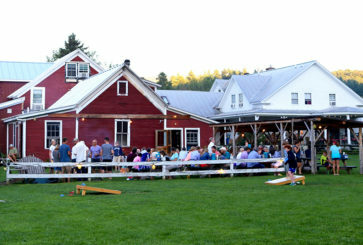 Family gathering with all sorts of ages are such great experiences for kids. 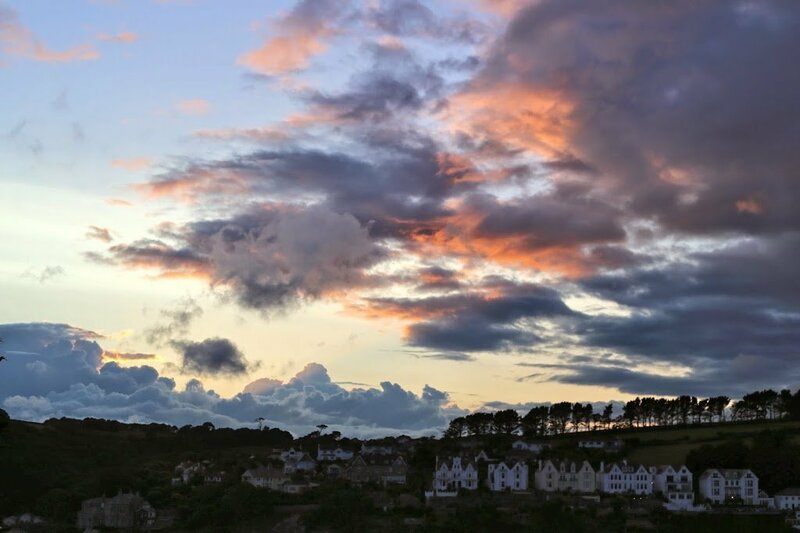 Picturesque Cornish village by the see, extra benefits:). Awesome vacation. I went back to my home country last March. It is always so much fun to be together with the family. Lovely photos. 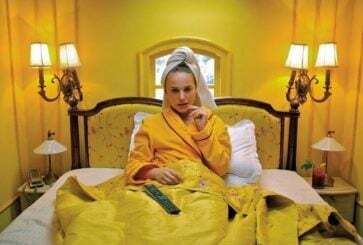 Are there bed and breakfast places that you recommend in that area? This post made me feel quite weepy. What a beautiful life you have; it’s touching how you share it with so many. What a wonderful article! I live in England, but have never been to Cornwall before, although my grandparents have. Gorgeous photography – my nan also has a height chart, haha! Three things I love: your cousin’s perfect waffle-weave sweater, you being amazed at your husband’s stone-skipping prowess (I discovered my husband’s talent for this on a summer vacation last year and was wowed as well! ), and the charming way you have to address a letter to your grandma. What a gift to spend time with family in such a beautiful place. What special times, Joanna. I absolutely adore the tradition of visiting your grandfather. Thanks so much for sharing! Earlier this year you posted about your brother in law’s cancer diagnosis. I noticed he and your sister were not in the photos. Hope they are still continuing to do well! Joanna, we just came back from Cornwall to, its wonderful. Have you heard about http://www.seasaltcornwall.co.uk. Loving it. Greetings from Switzerland. I love these so much. I never think of England as a place to go and be on the beach-thanks for the reminder! Oh I want to go to England! MUST post about the outtakes! lovely post, thank you for sharing! England for a longer trip in a few years. I love Cornwall. We’re lucky to have friends who own a hotel in port Isaac (where they film doc Martin) and we go down every month. It’s such a great escape. Are you sure you weren’t offered a ‘top up’ instead of ‘top off’? I live for top ups! Glad you enjoyed our lovely country. Joanna, sorry if I missed it but did you grow up in England? Do you have an English accent? What an adorable family. You all look like you had so much fun. You’re little munchkin is so cute! I love hearing your take on my homeland, Joanna. Chip butties are not for the faint of heart! Wonderful photos. Gorgeous family. Thank you for sharing. Lovely pictures – thank you so much for sharing! While studying abroad in London I was lucky enough to spend a weekend in Cornwall. We visited the Minack Theatre – have you ever been? It is an outdoor theater carved right into a cliff above the sea. Absolutely amazing. I definitely want to go back for another visit. Looks like a great family trip. How are your sister and brother-in-law doing? my goodness these photos are making me so happy!! your gray sweatshirt and cocktail, perfectly cozy and adorable! the babes… adorable! bunny, haha, adorable! 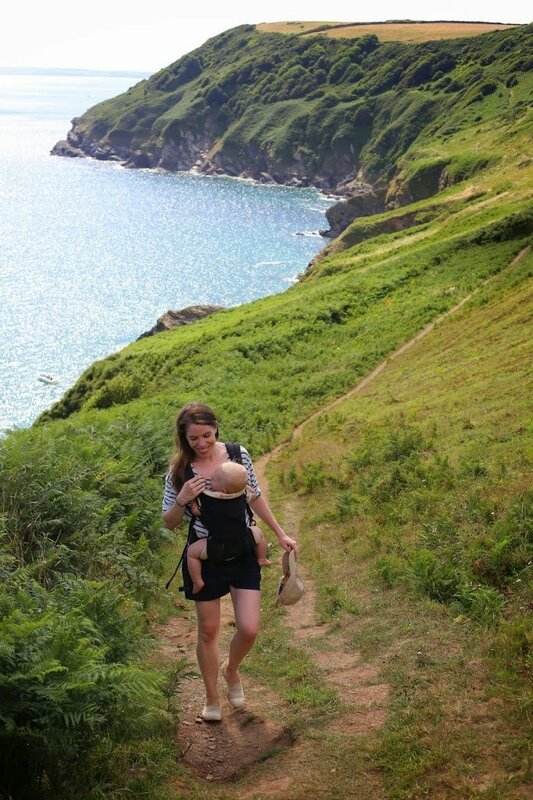 beaches and cows and magical views! what a fairy tale :) so glad you got some of that family time!! Lovely pictures! 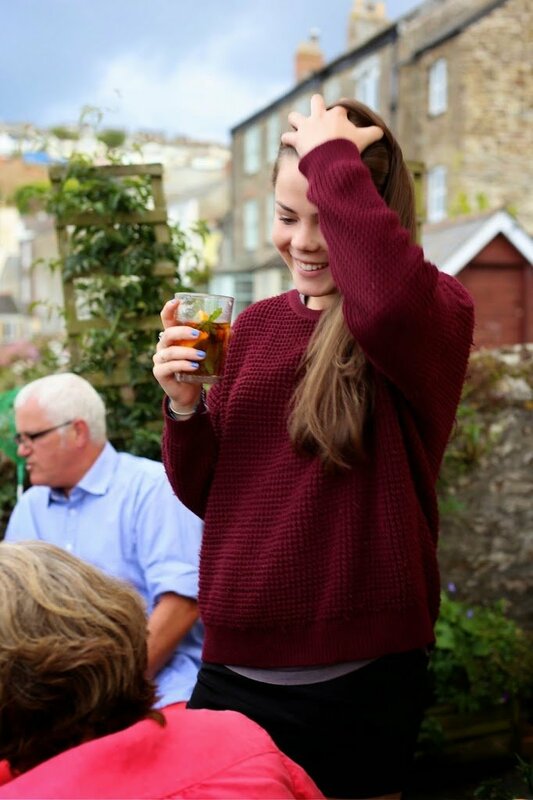 I spent a weekend in Cornwall when I studied abroad in London. Have you ever visited the Minack Theatre in Cornwall? It is an outdoor theater built right into the cliffs above the ocean. It was absolutely amazing – a place I definitely want to go back to again. 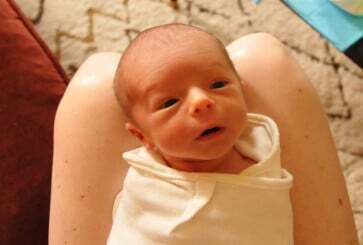 Toby looks JUST LIKE YOU in that first photo! Precious. You’re in my country! So surreal. I love cornwall. 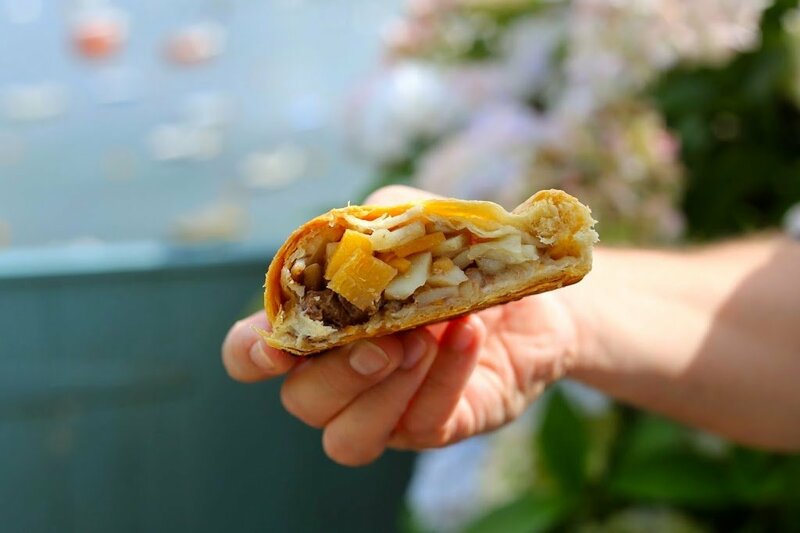 We eat pasties in northern Minnesota. It’s a traditional dish around here! I find that when I’m anywhere outside of the area and I talk about pasties, no one knows what the heck I’m talking about. Quite delicious. Thanks for the pics. I love pasties! They are a staple in Northern Michigan! Looks like such a lovely trip. I can’t wait to get back to my husbands home country! I loved eating pasties when I worked in Northern Michigan! 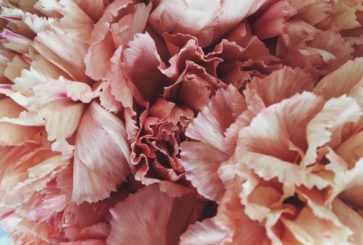 So incredibly beautiful – I can’t get over these photos! So glad you had a good trip. Thanks for sharing! Oh Joanna, I LOVE these pictures!! I want to visit England so badly and seeing your beautiful pictures just made my wanderlust kick into overdrive. Thanks for sharing! Ah, lovely. 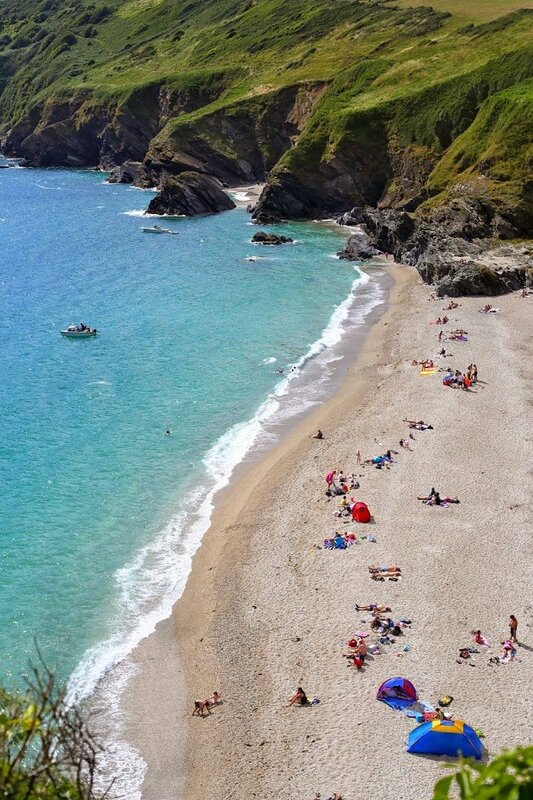 Must visit cornwall! And love your american translation of chip butty! Well you have certainly convinced me to visit! Lovely photos and an adorable family! Do you notice many tourists in this area? Or is it mostly locals and their families? Lovely photos! I absolutely LOVE your grandmother’s wall with the heights marked on it! What a collection! Looks like a beautiful vacation! Glad to you had fun. I have to say that I feel such a pang of sadness seeing happy cows out grazing in the fields the way they ought to live and then a picture of “beef” a few shots later. I wish more people would make the connection. Beautiful photos, looks like a wonderful vacation. I just posted about my recent summer vacation. The crowded wall chart is so sweet it almost made me tear up. What a wonderful well-loved home – how many children grown and growing up – a nice visual reminder of family history. What an amazing trip, great memories for your boys. Hahaha “squabbles” not pictured. Love that.